What Kinds of Trees Does Chicago Have? When the average person thinks Chicago, you think “urban.” You think of the skyscrapers of glass and steel that form that distinct skyline—the Hancock Center, the Sears (er, Willis) Tower, Tribune Tower, Trump Tower, the Crain building—and you think of the concrete and metal structures of Navy Pier, Wrigley Field, the Art Institute, and more. You think of paved streets full of cars and sidewalks full of tourists. What you probably don’t think of is greenery. And yet, according to a report by the USDA’s Forest Service a few years ago, more than one-fifth (21%) of the Chicago region is shaded by tree and shrub cover, including 15% just by tree cover. Fifteen percent may not seem like much, but that’s a lot of acreage considering how much land the Chicago Metropolitan Area covers. This requires a staggering amount of trees—more than 157 million, averaging just over 60 trees per acre in what is considered urban Chicago and more outside of that area. But what kinds of trees are they, anyway? Well, Chicago is home to over 161 species of tree, and going through them all would take quite some time. So, here’s a roundup of just the species which can most commonly be seen as you explore our great city, presented in descending order of the percentages they make up of the total tree population. This is, by far, the tree you are most likely to encounter in the Chicago area. European buckthorns make up a whopping 28.2% of all the trees in the region—more than five times the 5.5% that the second most common tree makes up. They have toothy, egg-shaped leaves, as well as brown bark with silvery corklike projections. They start with multiple stems at the base, but as they mature they develop a singular trunk, which can grow to a thickness of ten inches. Their height tends to be between ten and twenty-five feet. The female trees sprout clusters of small purplish-black fruit. You may want to think twice before trying them though, as they contain several seeds per fruit and have a laxative effect. The reason these trees are so overwhelmingly common is that they’re an invasive species. As the name suggests, they were brought over from Europe, and soon started spreading uncontrollably. Some states like Minnesota now list it as a restricted noxious weed and prohibit the import, sale, or transport of buckthorn. They dominate native species easily because their leaves sprout early in the season and stay on the tree until quite late, allowing them to starve the species sprouting around them of sunlight. By shading out other plants and outcompeting them for resources, they can negatively impact the health of wildflowers and other species, threaten natural habitats, and contribute to erosion by eliminating the plants that prevent it. Not only that, but they only provide 6.5% of the leaf area in the Chicago region while constituting 28.2% of the tree population. This means that they provide far less leaf area than other species, and thus contribute less in terms of air filtration and other services that trees perform for us. For those reasons, environmentalists in the area have spent much effort trying to minimize the growth of this tree and to instead encourage greater diversity in the population. In part owing to these efforts, in the City of Chicago itself they only comprise 4.4% of the tree population. But these trees are resilient, with resistances even against the insects and diseases which normally curb tree growth, and so the efforts to help native species compete continue today. The green ash is a tree that grows in an upright, somewhat oval shape, and provides ample shade. The grow quite fast and, when mature, can reach heights of fifty to sixty feet. They produce reddish-purple flowers, and as they age a diamond pattern emerges in their bark. Like all ash trees, they have compound leaves that split off into five to nine smaller leaflets. 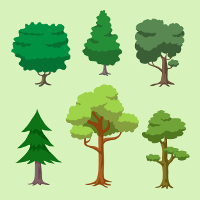 These trees are hardy, able to grow in many soil types and climates. They were introduced here to replace the diminishing numbers of American elm, which were being killed off by Dutch elm disease. But now they, too, are under attack—the emerald ash borer, an invasive beetle which devours trees and has decimated entire populations of tens of millions of trees across 27 states, has been threatening the ash population. Since this poses major problems for overall tree populations and diversity, conservationists have been working hard to combat the pest, but a solution has yet to be found. These trees have a dark brown bark when mature, with many interwoven ridges and furrows. They have compound leaves resembling poison ivy, and they sprout v-shaped samaras (those whirly things that spin through the air and resemble insect wings). They typically grow to between thirty and fifty feet. These trees are important for wildlife and help stabilize river banks where they often grow, but because they’re prone to infestation by the box elder beetles with which you’re likely already more familiar than you’d like to be, it isn’t recommended that they be grown near homes. These trees are usually small, have dark grey bark, are quite hardy, and sprout flowers and fruit the way you would expect a cherry tree to do. In addition to providing shelter as many trees do, the black cherry tree also acts as a vital food source for many animal species, including foxes, voles, deer, and a wide variety of birds. Their seeds also provide sustenance for several types of mammal, and the leaves feed caterpillars for many species of butterfly and moth. The American elm has simple toothy leaves, light grey furrowed bark, and small green flowers. They grow to be a hundred feet tall and four feet wide. These trees were once a dominant species in these lands, but their numbers have been significantly reduced by disease, in particular Dutch elm disease. Because of this, conservation efforts have been directed both to saving this tree, which serves as a habitat and food source to many animals, and to replacing it with the green ash tree. If you still aren’t sure what kind of tree it is that you’ve found in the Chicago, the Morton Arboretum has a Tree and Plant Finder which you can use to figure it out. And if your interest has been piqued reading about the tree-related conservation efforts going on in Chicago, consider volunteering with Chicago Gateway Green. Simply give us a call at 312-527-9621 or leave your info on our contact page and we can discuss the opportunities that are currently available. Work with us to expand and diversify Chicago’s tree population—because a greener tomorrow is a greater tomorrow.